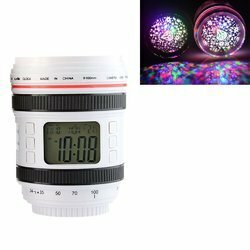 PROJECTOR CLOCK IS A DESKTOP PRODUCT WITH 3 UNIQUE FEATURES. 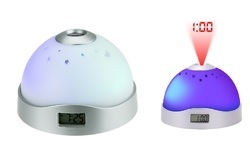 - Nature sounds can also be set as alarm so you don't need to wake up to harsh alarm clock sounds. 1. you can select the clock display time format as one mode of below: 1) analog needles display with arabic numberals 2) analog needles display with roman numberals 3) digital time display 2.with adaptor for projection power AC100--240V/DC3.5V 50/60HZ 3.need 1 AAA power for time working 4. project angle can be adjusted 180o 5. Plays 16 classical songs as background music.